IT’s customers want agility when it comes to application deployment across multiple new technologies. And if they don’t get the responsiveness they need from their IT department, they’ll go rogue, deploying cloud-based applications that end up as shadow IT. From an internal standpoint, deploying these new technologies presents organizational challenges, too. 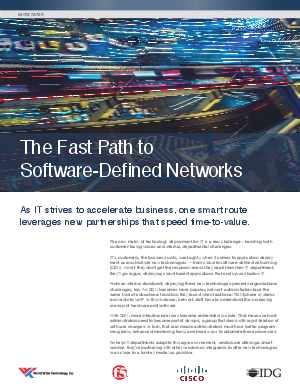 As SDN becomes more popular, network administrators face the same kind of educational transition they faced when traditional TDM phone systems evolved into VoIP. In this instance, network staff have to understand the increasing overlap of hardware and software. With SDN, more infrastructure rules become embedded in code. That means network administrators need to become part of devops. In turn, that also means administrators must have better programming tools, enhanced monitoring tools, and more ways to automate those processes. To help IT departments adapt to this agile environment, vendors are offering a smart solution: they’re partnering with other vendors or integrators to offer new technologies in as close to a turnkey model as possible. All told, these partnerships represent a new trend that addresses the all-important need of agility and time-to-value for new deployments. They not only give IT a head start on deploying and implementing new technologies but they’re also pioneering ways to ensure that they can transfer knowledge to enterprise IT staff, arming them to maintain efficiency long after the consulting engagement has ended.